While many of the technologies AV integrators offer are designed to eliminate the need for business travel, somebody’s got to deploy them. For a large portion of SCN’s readership, this means getting on a plane, staying in a hotel (or, increasingly, renting a place through Airbnb), shuttling back and forth between client sites (increasingly via Uber), and, hopefully, eating a decent meal every now and then—and incurring the expenses that go with it. Business travel remains a necessary evil—“evil,” mainly because we seem to have so little control over how much we spend on it. Christal Bemont, senior vice president and general manager of the small, mid-sized, and nationals business unit at Concur. According to Concur, a travel management platform developer headquartered in Bellevue, WA, organizations spend 8 to 12 percent of their total budgets on business travel. Christal Bemont, senior vice president and general manager of the small, mid-sized, and national business unit at the company, argues that these costs can be controlled— she said that on average, travel is the second largest controllable expense—but that automated services like the ones Concur offers contribute to keeping costs down. “Many companies assume automation is too expensive or too complicated for a small- to mid-size company, but this couldn’t be further from the truth,” she said. She also points out that the back-office functions, such as receipt collection, managerial approvals, and reimbursement can be costly when done manually. Julie Simpson, senior consultant at Goldspring Consulting, a travel management provider based in Winston-Salem, NC, said that if companies don’t issue travel guidelines to their employees, they will have a hard time managing travel costs. “If they don’t have a clear policy in place, it’s very difficult for their travelers to know what’s expected of them when they do travel, and it’s hard to get a handle on what they’re spending if the information isn’t collected and reviewed,” she said. The Rocketrip platform combines trip information (where and when the employee will travel), the guidelines in a company’s travel policy, and realtime rates, to produce a “budget to beat.” When the employee beats the budget that Rocketrip has supplied, they earn “Rocketrip Points” that are redeemable in its rewards store, where they may purchase merchandise, gift cards, or even make charitable donations. A travel policy should be clear, concise, and easy to find. And, if it’s destined for employees that are responsible for booking their own trips, it should provide answers to common questions. Can they book more expensive direct flights rather than making connections? Can they fly business class? Will they be reimbursed if there is a charge for them to check their bags, or to reserve their seat? Do you require them to book a trip a certain number of days in advance in order to secure better rates? When is it acceptable to book last minute? The policy should also include guidelines for hotel bookings. “When it comes to hotel accommodations, there are frequently caps in place,” Simpson explained. “If you’re traveling to San Francisco, New York, Washington D.C., [or] Boston, it’s acceptable to book a hotel room that’s over a certain amount; otherwise, you’re expected to not spend more per night than a set amount.” Per diem allowances, and instructions on when it’s acceptable to rent a car are also part of a good policy. As for Uber and Airbnb, Simpson said that most companies leave their employees to decide whether or not they prefer using these services over traditional services, rather than mandating them outright. Dan Ruch, founder and CEO of Rocketrip. Dan Ruch, founder and CEO of Rocketrip in New York, NY, argued that the problem with conventional travel policies is that they don’t give employees an incentive to save money. If your policy states that flying business class is O.K., why on earth would they sign up for coach? The Rocketrip platform addresses this question by combining trip information (where and when the employee will travel), the guidelines in a company’s travel policy, and real-time rates, producing a “budget to beat.” When the employee beats the budget that Rocketrip has supplied, they earn “Rocketrip Points” that are redeemable in its rewards store, where they may purchase merchandise, gift cards, or even make charitable donations. This gives employees choices: do they really need to fly business class on a two-hour flight? Can they book an Airbnb apartment or stay at a friend’s instead of a hotel? “Effectively you flip the model, and now, instead of trying to control how much employees spend, you’re rewarding them for spending less,” Ruch said. “Not only from a financial perspective, the benefits are enormous, but you create a culture where, for the first time ever, employees are excited about saving money. 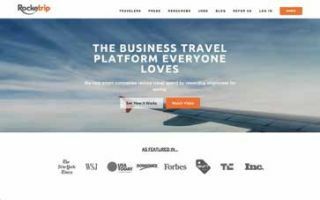 It’s a small shift in culture, but it’s a big impact on the bottom line of the organizations that we work with.” Rocketrip claims its platform saves organizations 30 percent in travel costs, and right now the company generally serves businesses that generate $500,000 or more in travel expenses per year. One of the things that small- to mid-sized organizations struggle with is that while their travel expenses may be significant to them, they don’t generate enough travel volume to interest airlines and hotel chains in negotiating discounted rates. While enlisting the services of a travel agency that already has these agreements in place is one way around this, not all of them want to work with smaller businesses, either. But while this leaves many organizations with the task of rate shopping and booking, there are a number of tools out there that will comparison shop and centralize travel itineraries and all the accompanying documentation, making it easier to track and compile expenses. An online service that continually scans hotel rates, notifies you of the best prices, and alerts you when the rate of the room you booked goes down, enabling you to cancel and make a new reservation for less. An app for travel planning and management. An app that compiles bookings and travel itineraries into one source. A travel booking and management app that will compare rates and let you know when more favorable prices are available.